After the vote the winner was announced by Hans van Gemeren of the trial committee. 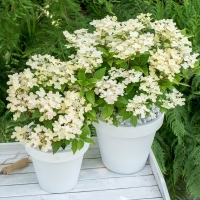 The title Best Novelty 2018 goes to Hydrangea paniculata ‘Breg14’ (POLESTAR). POLESTAR is a very compact and early flowering H. paniculata. From the end of May, the first buds will appear, which end up in screen-shaped flowers at the end of May in early June. The flowers start white and turn pink to pink during the summer. This Hydrangea was won by A.J. Bregman from Benthuizen and for the trial at the Garden Trials and Trade 2018 submitted by Breederplants BV.